You are currently browsing the archive for the This Day in New York History category. 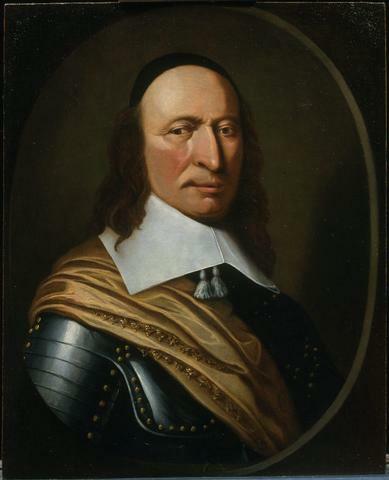 Whereas the Honble Director General and Council of New Netherland have daily seen and remarked that the Goats and Hogs here around Fort Amsterdam daily commit great damage in Orchards, Gardens and other improvements, whereby it follows not only that the planting of beautiful Orchards and Gardens are prevented, but considerable damage is done to Individuals. Therefore the Honble Director General and Council, willing to provide herein, do, from this time forward, Ordain and Enact that no Goats nor Hogs shall be pastured or kept between the fortification of New Amsterdam (or its vicinity) and the Fresh Water, except within each its own inclosure, and that so well constructed that the Goats do not leap over it, and commit damage on any person; Also, Goats beyond the Fresh Water shall not be pastured without a Herdsman and Keeper, on pain of having the Goats found at large on this side of the Fresh Water, or without a Herdsman or Keeper beyond it, taken up by the Fiscal and declared forfeit beherded by the Honble Director General and Council. Let every one be warned hereby and take heed against loss. No more freely roaming goats and hogs in New Amsterdam. Keep ’em enclosed or they’re forfeited to the state! Today is actually the anniversary of another landmark in the regulation of domestic beasts. In 1894, New York became the first state to enact a law requiring that dogs be licensed. The fee was $2 per license. One hundred nineteen years later, the fee has gone up to $8.50. Benefits include the new “NYC Dog eLocator System,” an online service available to anyone who finds a lost dog that is wearing a New York City dog license. As you know, Labor Day is a federal holiday in the USA, which is traditionally regarded as the final day of summer and (in some circles) the last day on which you can tastefully wear either white or seersucker. The day is meant to celebrate the contributions made by workers to America’s economic and social well-being and was first celebrated as a public holiday by the state of Oregon in 1887. It became a federal holiday in 1894. Labor Day, 1887 happens to be the day on which the picture above (from the New York Public Library’s Digital Gallery) was taken. 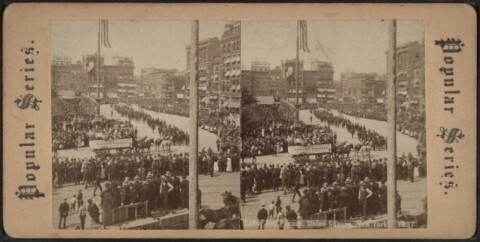 The picture depicts the Fireman’s Parade in Union Square, the frequent site of labor rallies over the years. The first Labor Day celebration in New York took place in the square 5 years earlier when a parade of more than 10,000 workers marched up Broadway and past a reviewing stand in Union Square. Like many professors, I associate Labor Day with the start of the school year. It’s the last day before classes begin at NYU and, before last year, a spent a decade’s worth of Labor Days right there in Union Square, since I was living one block away at NYU’s University Hall. This year (like last year), I’m spending Labor Day in Abu Dhabi, where the NYU fall term has already begun (classes began on Sunday since the work week in the UAE is Sunday to Thursday) and it most certainly doesn’t feel like the end of summer: hot and humid weather will continue here for at least another three weeks or so and even then it’ll still feel like summer throughout the months when New York marches through fall, winter, and spring. What you’d see is an early version of 3D. 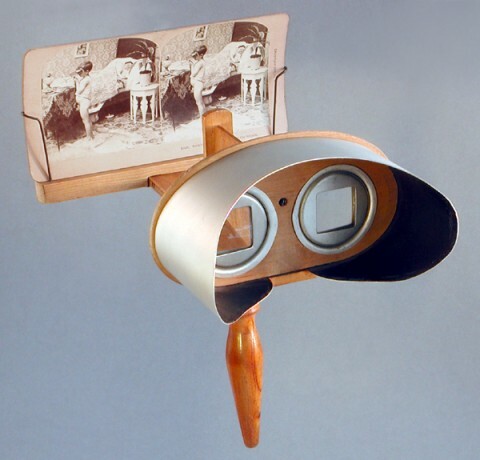 The stereoscope was invented in 1838 by Sir Charles Wheatstone, and in the 1850s Oliver Wendell Holmes devised the more economical version pictured above, variants of which remained in production for the next century. 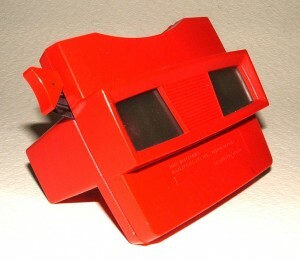 You’d put in a round Viewmaster disk, which had 14 little slides at its perimeter. The viewer would then combine pairs of slides into images, seven per reel. You’d rotate the disk (and move from image to image) by pressing the lever on the left. My collection, as I remember it, had lots of travel scenes and a fair number of Disney items. Halfway around the world from New York City, my 9/11/11 began in the most uncanny of ways. You can read about it over at patell.org. And you can read an alternative account of the same event over at mannahattamamma.com. How did you mark the day? The other night I took a group of students to NYU’s Skirball Center to see a star-studded reading of Sarah Tuft’s play 110 Stories. 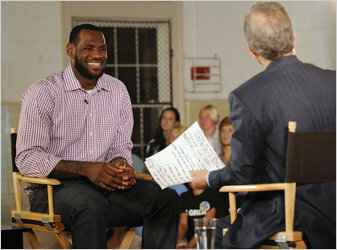 A good chunk of the cast came from the HBO series The Wire. When I first saw it performed — I think it was in September 2003 — the cast had a liberal sprinkling of Sopranos actors. The concept — the play weaves a dozen or more first-person testimonials of 9/11 and the rescue effort — is emotionally wrenching if a little vexed in performance: the stories all come from ordinary New Yorkers but the draw (aside from fundraising for a worthy cause) is a stage full of famous people, some of whom are also New Yorkers who must have their own personal stories from that day, on hold while they read someone else’s. The two times I’ve seen 110 Stories I was there to support a friend who inadvertently wound up as one of Tuft’s character. She was “played” the first time around by Edie Falco. The other night Katie Holmes read her story. My wife and I get a shout out at one point — and it’s kind of odd to hear Edie Falco or Katie Holmes call out your name on stage. Our friend’s story is stage-worthy largely because of a drama we initiated when we decided to take her kid from the elementary school where our daughters were also enrolled, which was a couple blocks from the World Trade Center. She hadn’t returned to pick him up for some reason and we didn’t feel comfortable leaving him behind when we evacuated. Most of the kids were already gone with parents, and we worried that if the building toppled it could crush the school. We were listed as emergency contacts, and so we told his teacher we would take him to our apartment on Water Street and meet his mother there. Our friend finally made it to the school just before the first tower collapsed. She exited through the cloud of debris, bound to find us. None of us had cell phones, and even if we’d had them they wouldn’t have worked. Our morning on 9/11 was spent desperately trying to reunite our friend’s son with his mother. 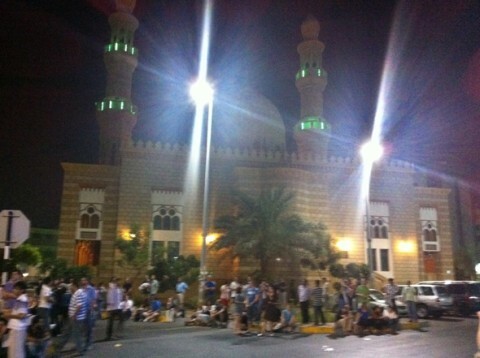 Before we could return to our apartment, the neighborhood was in lockdown and police told us to go north. The first tower collapsed while we were just above City Hall and, with tens of thousands of others, we turned and ran until we were well up Lafayette Street. We took refuge in my office at NYU and started phoning and emailing anyone we thought might be able to relay a message to her about our location. She, meanwhile, managed to talk her way through one police barricade, circumvented another by climbing a chain link fence, and made it to our apartment only to find it empty. She left us a note we discovered on the dinner table when we were finally allowed to return to our apartment over a month later. Before we were all finally reunited, we received word by email that she somehow had learned where we were and knew that her son was safe. When she showed up at my office, covered in ash, she had a dust mask pulled up and sitting on top of her head and someone else’s blood on her shirt. She laid down on the floor outside my office, exhausted. It still feels strange to tell that story. I first wrote it down two days later, in an account I only this week shared with our friend’s son. In that account, I mention that he and I emerged from the elementary school while jumpers were still falling from the towers, their clothes billowing like parachutes that for some reason refused to open. It’s without a doubt the most terrifying thing I’ve ever witnessed, even worse than the initial sight of the first plane soaring over my head and into the North tower only blocks away. Our friend’s son began to weep, and I lied and told him it was office furniture falling, not people. What will he think when he reads my confession? How many times have I wondered if we did the right thing to get him out of there safely, thereby making our friend’s experience even more nightmarish than it would have been? I felt a strange detachment reading my own words last week when I opened up the file on my computer, the same sort of detachment that came while listening to Katie Holmes read my friend’s side of the story. Clearly this is a morning that continues to haunt all of us. For me, the wounds are less raw than they were at five years (“What opium is instilled into all disaster!” Emerson writes in “Experience”), but I’m much angrier than I was then: how much bloodshed, economic disaster, bigotry, and loss of civil liberties have we suffered — not just as a result of the attacks, but of our own government’s rush to war and the political legitimization of the right wing’s lunatic Tea Party fringe? If I’m experiencing any hope on this ten year anniversary, it’s due to the resilience of the kids we were with that morning — our own, and our friend’s. Her son was on MSNBC this morning, a young college student, now much taller than I am, talking about how the events of 9/11 have made him an engaged world citizen, how they’ve compelled him to be more tolerant of different perspectives and experiences than he might have been otherwise. We’re meeting up with him and his mom in a couple hours, along with other people we spent parts of that day with, including some total strangers who opened their West Village condo to us a few hours that afternoon so we could make contact with friends and find a place to stay. We haven’t seen some of these people in ten years, but their generosity — and that of dozens of friends and family across the country who reached out to us in a time of need — has imperceptible influences on our lives every day. Thank you. 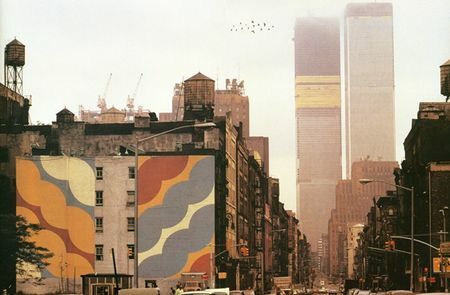 Photo of WTC under construction shamelessly nabbed from Alex Smith’s Flaming Pablum. The flight was a bold and perilous one; but here I am, in the great city of New York, safe and sound, without loss of blood and bone. In less than a week after leaving Baltimore, I was walking amid the hurrying throng, and gazing upon the dazzling wonders of Broadway. The dreams of my childhood and the purposes of my manhood were now fulfilled. I was soon taught that I was still in an enemy’s land. A sense of loneliness and insecurity oppressed me sadly. … It takes stout nerves to stand up, in such circumstances. A man, homeless, shelterless, breadless, friendless, and moneyless, is not in a condition to assume a very proud or joyous tone; and in just this condition was I, while wandering about the streets of New York city, and lodging, at least one night, among the barrels on one of its wharves. 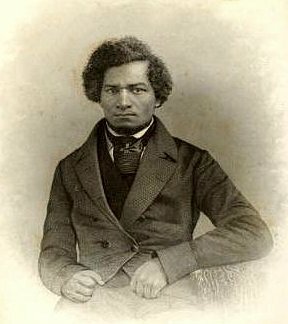 I was not only free from slavery, but I was free from home, as well. So today will not go down in New York history as the day that LeBron James came to the Big Apple and brought the New York Knicks not only back to respectability but also back to championship calibre. As a once and (I hope) future Knicks fan — I can still see Charles Smith failing to get either a basket or a foul off Horace Grant in four attempts under the basket during the 1993 Eastern Conference Finals — I’m disappointed that James didn’t choose to become King of New York. A Knicks team led by James and Amar’e Stoudamire would have made for a great rivalry with a Miami Heat team led by Dwayne Wade and Chris Bosh. Still, though, you can’t help respecting a sports superstar who chooses to take less money (mind you, he’ll still get a ton) to play with his friends (Dwayne and Chris) with the hope of winning not one but several championships together. We’ll see if these guys will be able to do the really hard thing and share the ball so that they complement rather than thwart one another. Meanwhile, I hope for Miami’s sake that they’ve decided to leave enough money in Pat Riley’s budget to field a full team. Right now the Heat have, what, four players under — or about to be under — contract? Here’s what I fear: that the Knicks will indeed revive themselves but that — in the same way that the Knicks of Patrick Ewing, Charles Oakley, Charles Smith, and John Starks could never get the best of Michael Jordan, Scottie Pippen, Horace Grant and their Bulls teammates — Stoudamire and Co. will come close but never get the best of LeBron James, Dwayne Wade, Chris Bosh, and whoever plays for the Heat with them. Here’s hoping that I’m right about the Knicks’ revival and wrong about their becoming also-rans. In any case, Stoudamire and Co. have got to be more watchable than the teams that Isiah Thomas saddled us with lo these many years. A History of New-York, from the Beginning of the World to the End of the Dutch Dynasty; Containing, among Many Surprising and Curious Matters, the Unutterable Ponderings of Walter the Doubter, the Disastrous Projects of William the Testy, and the Chivalric Achievements of Peter the Headstrong — The Three Dutch Governors of New Amsterdam: Being the Only Authentic History of the Times that Ever Hath Been or Ever Will Be Published. The volume, ostensibly by one Diedrich Knickerbocker, whose supposed disappearance had been publicized in the pages of the Evening Post, was in fact the work of a young lawyer-turned-writer named Washington Irving. The book was well reviewed on both sides of the Atlantic and made Irving a literary star. Eighty-five years ago today, which happened to be a Thursday and therefore Thanksgiving, Macy’s held its first parade. As the ad on the right indicates, it wasn’t called the “Thanksgiving Day Parade”; it was, instead, the “Big Christmas Parade, Welcoming Santa Claus to New York!” The parade route started at Convent Avenue and 145th Street, proceeded down 110th Street to Eighth Avenue, where it turned downtown, finally reaching Macy’s front door at Broadway and 34th Street. Sarg would go on to design the first balloons used in the parade — Felix the Cat, a dragon, an elephant, and a toy soldier — which replaced the troublesome live animals. These first balloons were helium-filled and exploded shortly after being released (the designers having forgotten that helium expands as it rises). The following year, Macy’s experimented with a helium-air mixture and safety valves that allowed them to float for a few days. Macy’s address was sewn into the balloons, and anyone who returned a fallen balloon to the store would receive a special reward. On 10 November 1969, on PBS, the first episode of Sesame Street aired, sponsored by the letters W, S, and E and the numbers 2 and 3. Magical or not, what Sesame Street offered in its city street scene was a space that felt lived in, worn, repurposed, ordinary. (At least, it started out that way.) And yet it housed something extraordinary: the accommodation, the cosmopolitan celebration, even, of difference. Some sketches, to be sure, established universals: everyone eats, everyone sleeps, even though “everybody” in both cases is shown in the end to be made up of a bunch of differences. (Thanks again goes to Joe Raposo for the score to those daily activities.) The late-breaking, treacly classic “We Are All Earthlings” would also seem to preach a universalist gospel, but even that song begins by articulating difference. The show foregrounded not simply diversity but the experience of being different — being the one thing that wasn’t just like the others — in language, color, and economic class, even in lifeform. And it made it plain that difference was not simply a fact of life, but that it was okay, maybe even fun. Humans interacted with Muppets. Mr. Hooper represented a generation older than the principal adults on the cast. The humans on set, adult and children, were surrogates for an audience of diverse ages. The show aimed to please children and adults — including grandparental care-givers — alike. Only over time did they broaden their focus to include us country kids (see below), though it should be understood that where I lived we already knew where milk came from without Lorne Greene telling us. The differences encountered by watching the show — even when it rendered me an outsider — were part of what made it so interesting. Come to think of it, I’ve looked a lot like that city kid for most of my adult life. It’s only the last few years I’ve had my hair cut short. I wonder if this guy has been burrowed in my subconscious all that time. The sketch puts a primary difference up front, both to value that difference and to affirm one’s identity — and also, I would argue, to allow one to imagine other identities than the ones you were born into. Sesame Street didn’t have to wax metaphysical to make New York seem enticing. All it took was a Raposo melody and some seemingly random footage of the city in winter. Can you identify places pictured here? Things that remain the same? Things that have vanished? On the first episode of Sesame Street (which you can get on the Old School Vol. 1 DVD set or with this book, but which I can’t seem to find on YouTube), Gordon escorts a little girl named Sally — clearly a proxy for child viewers — around the neighborhood, introducing her to human and Muppet characters. “Sally, you’ve never seen a street like Sesame Street,” he tells her. “Everything happens here. You’re going to love it.” Michael Davis responds to this line: “everything and anything can happen on Sesame Street — except bad stuff.” Not necessarily so — at least not mildly bad stuff. One of the show’s genius strokes was to let characters — usually Muppets or characters in animated segments, but sometimes the humans, too — feel all kinds of unpleasant emotions, from frustration, to the isolation of difference (even if it’s a difference that makes you feel ordinary), to embarrassment over mistakes, to annoyance at your friends, to miscommunication. In some cases, but not all, these issues are worked through. But things work out for different people in different ways. What’s remained constant for 40 years is the affirmation that no matter how isolated or different you may feel, someone else somewhere — maybe just a ten-ton Muppet no one else can see — cares enough to make the loneliness go away, that someone who’s different from you may be able to care about you nonetheless. Eighty years ago today, New York Yankees outfielder Babe Ruth became the first major league ballplayer to hit 500 home runs. He accomplished the feat at Cleveland’s League Park in the second inning against pitcher Willis Hudlin. Ruth was 34 years old at the time, and the homer was his 30th of the season. The Indians won the game, however, beating the Yankees 6-5. Ruth would hit his 600th homer 2 years and 10 days later; it would take him almost 3 more years to hit his 700th. Two other players hit their 500th home runs while playing for the Yankees: Mickey Mantle in 1967 at the age of 36, and Alex Rodriguez in 2007 at the age of 32 (making him the youngest player to reach the milestone). Former Yankee Reggie Jackson hit his 500th after leaving the team to join the California Angels. The only player to hit his 500th home run while wearing a New York Mets uniform is Gary Sheffield, who hit his dinger earlier this year, becoming the 25th man to accomplish the feat and the only player whose 500th home run was also his first home run for a new team.